Guess what? The folks at Pivot TV have teamed up with TerraCycle to create a show called Human Resources. It premiers on August 8th, but you can get a sneak peek right here. I'm thrilled for two reasons. 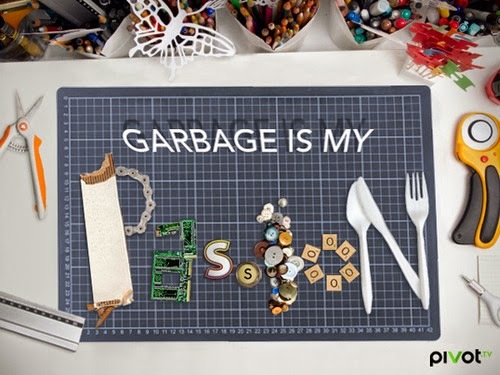 First, a TV show that will shine a light on real, large-scale upcycling starts soon. Second, I got the press email with a request to share and promote. Which means my little blog is known enough in this niche to be worth contacting! The official blurb: Pivot TV has a new show that't taking the trash out of TV. 'Human Resources' will follow TerraCycle, a company who's mission is to "eliminate the idea of waste." Get inspired by their crafty products that will change the world! Human Resources is a 30 minute comedy reality show that’s going to look at TerraCycle’s day-to-day. It's not a how-to. It's scripted and quirky and based inside one of the most exciting companies in the world. This isn’t the first DIY TV show about TerraCycle. National Geographic produced a reality series about the company back in 2009 called Garbage Moguls. The show ran for two seasons in 2009-2010. You can watch Human Resources on Pivot TV in August. If you’re like me and don’t have cable, they also stream their shows for free on their website.